November 7 of this year marks 100 years since the Bolshevik Revolution in Russia—the result of a series of events that were so complicated, cunning, and violent that the facts and causes are still being debated by historians; or to be more precise, these facts and causes are being carefully revisited after the fall of the communist regime, since this can now be done more freely, for obvious reasons. After the abdication of Tsar Nicholas II (another hotly debated subject—did he voluntarily abdicate or do it under pressure, and did he abdicate at all? ), the restraint on total chaos was gone. A provisional government came to power after the so-called February Revolution, but this government, being the liberal one that Western-facing elites so longed for, was inherently weak. World War I was still raging, and the Russians had suffered great losses—estimated at around two million. Enter Vladimir Ilyich Lenin (born Ulyanov) and his Bolshevik party, which stormed and vandalized the Winter Palace in Petrograd—an act that would go down in history under the name of the “October Revolution” (at the time, Russia was still using the Julian calendar as its civil calendar, and this happened on October 25, 1917). Lenin signed a separate peace agreement with the Germans putting an inglorious end to the war for the Russian people who had sacrificed so much, just months before they would have inevitably won it. A bloody civil war ensued, and all hell literally broke loose on the Russian nation. 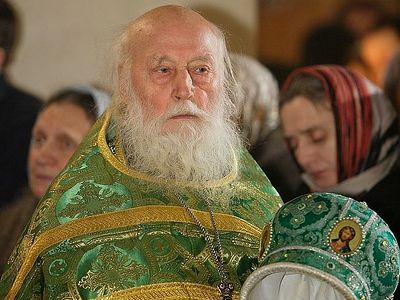 Russia descended into its “long, dark night”, as Patriarch Tikhon foresaw just before his death. As we mentioned, Russian historians and thinkers are trying to answer the many unanswered questions with resurgent vigor. Why did an Orthodox Christian nation destroy its own rich, beautiful culture? Why, just as the nation was experiencing unprecedented economic and industrial growth, did it suddenly become a riotous madman, sabotaging its own industry and agriculture? How was such evil unleashed, brother perpetrating it upon brother? 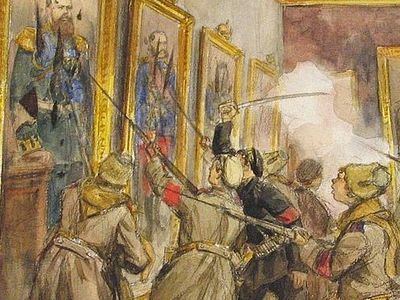 Historical circumstances and deeds are being aired that people have not learned about in Russian history classes—neither in Russia, nor in the West. This is an enormous subject about which volumes have been written and are still being written, and we hope to visit this subject informatively in days to come. But today we would like to give voice to holy, God-bearing and prophetic Russian men, who saw the roots of this tragedy even before it burst forth into people’s bewildered reality. Why is this subject so important to us (and we must understand that it is of very serious importance to us) who may have nothing to do with Russians or Russia? Those who have ears to hear, let them hear; and those who have eyes to see, let them see. These prophecies were published in the May-June 1973 issue of The Orthodox Word, (St. Herman Brotherhood, Platina, California), in an article entitled, “The Fall and Resurrection of Russia. The Words of Nine Prophets of Holy Russia on the Destiny of Russia”. The prophetic visions related below contain the basic features of what has been revealed concerning the future of Russia. They were compiled almost entirely from primary sources, and the prophets themselves are all either canonized saints or men recognized by their contemporaries and successors as righteous, God-bearing elders. Once I was in great sorrow, reflecting on what would happen to our Orthodox Church if the evil of our time would continue to increase more and more; and being convinced that our Church was in an extremely lamentable condition, both because of the immorality of the flesh which was increasing, and likewise—if not indeed even much more—because of the impiety of spirit through the godless philosophies which were being spread everywhere by the newest false teachers, I very much desired to know what Batiushka Seraphim would tell me about this. “Twenty times more. Then judge for yourself how many we have now who are still faithful to God! So it is, Batiushka, so it is: Whom He did foreknow, He also did forechoose; and whom He did forechoose, He also did predestinate; and whom He did predestinate, He will also watch over and glorify. And so, what is there for us to be downcast about!... God is with us! (Rom. 8:29-31.) He that trusteth in the Lord shall be as Mount Zion, and the Lord is round about His people (Ps. 124:1-2). The Lord shall preserve thy going out and thy coming in from this time forth even forevermore; the sun shall not smite thee by day nor the moon by night (Ps. 120:6-8). “Once late in the evening I was sitting in my cell alone reading the Epistles of the Apostle Paul, and I stopped on the second chapter of his Second Epistle to the Thessalonians, on verses 2 through 10. I stopped on these frightful verses of the holy Apostle and became deep in reflection, considering the appearance in the world of the man of sin, the son of perdition, whose very appearance would be according to the activity of satan, so that this frightful man would sit in the temple of God, giving himself off for God and demanding for himself Divine honors. 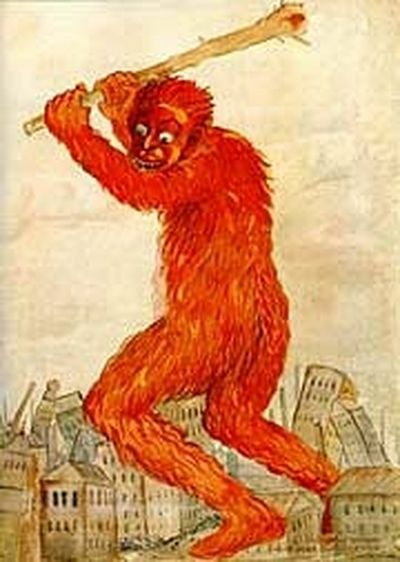 What kind of frightful man this will be, I thought, and what a frightful time will that be for those living on the earth! At the same time, naturally, there came the desire not to see this terrible time, and therefore there was formed in my mind the basic thought of turning to God in such words: O Lord! Grant me not to see this terrible time! At this time I felt that someone behind me had placed his hand on my right shoulder and said: ‘You yourself will see it in part’. “I was standing at night in some kind of high building. Around me there were many large constructions, such as there are in large cities. Above me was the vault of heaven, adorned with brightly shining stars, as happens on a clear, moonless night. Looking at the vault of heaven, I admired the beauty of the fixed stars. Then, turning my glance to the east, I saw there, coming up from behind the horizon, an oval of enormous dimensions; it was composed of stars of various sizes. In the middle of the oval in its upper and lower parts, there were stars of large size, which gradually became smaller, and at the sides of the oval they became quite small. In the midst of the oval there was traced with large letters the name ALEXANDER. “Having followed with my eyes the oval of stars until it was concealed in the west beyond the horizon, I again looked to the east and l saw: There came out from there a second oval of stars, just as magnificent as and in all respects like the first one, and in its midst there was depicted another name in large letters - NICHOLAS. And an inward voice informed me that after Alexander I there would be, as the successor of his throne, Nicholas.2 And this was astonishing for me, for the heir of the throne was not Nicholas, but Constantine Pavlovich. This oval also went just as majestically along the horizon and, setting in the west, was hidden beyond the horizon. “Having followed this oval also with my eyes, I again directed my gaze to the east, and again I saw there an oval of stars rising, in form like the first two in all respects, but considerably smaller in size and composed of stars of small size and, in addition, with the color of blood. In the midst of the oval there was depicted with bloody letters the name—ALEXANDER. And an inward voice informed me that after Nicholas the successor of his throne would be Alexander, whose days would be shortened by an evil deed.3 This oval went along the sky and was quickly hidden in the west beyond the horizon. One Sunday in the Autumn of 1916 in the Monastery of St. John in Petersburg, where the venerators of Father John used to gather, the Liturgy was celebrated by Metropolitan Macarius of Moscow. After the Liturgy, in the quarters of the Abbess of the Convent, Abbess Angelina, there gathered a number of clergymen and military men. Metropolitan Macarius read for those who had gathered one place in the diary of Father John of Kronstadt, in which were described his visions and prophecies concerning Russia... It turns out that many years before the Great War, Father John wrote absolutely precisely in his diary both the participants in the war and the outcome of the war. Father John likewise prophesied the military failures of Imperial Russia and the Revolution bound up with them. He indicated that the dominance of revolutionary ideas would be prolonged, that there would be innumerable casualties of the Revolution, rivers of blood, the woe and misfortune of the entire population. The deliverance of Russia from the Red yoke Father John prophesied as being from the East. Now we are undergoing the times before Antichrist, but Russia will yet be delivered. There will be much suffering, much· torture. The whole of Russia will become a prison, he said, and one must greatly entreat the Lord for forgiveness. One must repent of one’s sins and fear to do even the least sin, but strive to do good, even the smallest. For even the wing of a fly has weight, and God’s scales are exact. And when even the smallest of good in the cup over­ weighs, then will God reveal His mercy upon Russia. Ten days before his re­ pose he said that the end would come through China. There would be an extra­ ordinary outburst and a miracle of God would be manifested. And there will be an entirely different life, but all this will not be for long. The clairvoyant Elder Barnabas spoke of the disasters coming upon Russia and the cruel persecutions against the Orthodox Faith. When in the women’s monastery which he founded there was being built a great and magnificent church, one of the nuns was telling Father Barnabas about this with enthusiasm, but the Elder replied: “You will live until the tune when not only will this church not be here, but even the very place on which it stands will be paved over.” This nun told us this after the Revolution. The words of the elder were fulfilled. Not only was this marvelous church destroyed, but the very place where it had been was paved over. Some of the New Martyrs of Russia have likewise spoken similar things, using the words of the Holy Fathers that there would come such grief as the world has not yet seen, but then there would come a short flowering—before the end of the world. Truly, has there ever been a grief more bitter than the persecutions of the satanic regime which destroys and defiles everything holy—churches, icons, holy relics—with a purely diabolical rage, torturing old priests and monks, putting out their eyes, cutting off their noses and tongues, crucifying them, shooting them in the mouth while saying, “We are giving you communion”? But the persecutions evoked an unheard of flowering of faith. People have gone to tortures and death joyfully, with singing; there have even been children confessors and martyrs. And the general opinion in Russia has been that such a flowering could only be before the end of everything. Concerning this spiritual flowering Bishop Peter the New Martyr also spoke. He did not speak of an outward flowering. Those who live only by the world’s standards cannot understand this; for this there is must be a revelation to the heart. You ask me about the near future and about the last times. I do not speak on my own, but give the revelation of the elders. And they have handed down to me the following: The coming of Antichrist draws nigh and is very near. The time separating us from him should be counted a matter of years and at most a matter of some decades. But before the coming of Antichrist Russia must yet be restored—to be sure, for a short time. And in Russia there must be a Tsar forechosen by the Lord Himself. He will be a man of burning faith, great mind and iron will. This much has been revealed about him. We shall await the fulfillment of what has been revealed. Judging by many signs it is drawing nigh, unless because of our sins the Lord God shall revoke, shall alter what has been promised. According to the witness of the word of God, this also happens. We can see from these prophetic sayings coming from Holy Russia down to us that although there were many outward factors leading to the terrible cataclysm of revolution, all is in God’s hands—Russia’s fate is a mystery that indeed has meaning and consequences for the whole world. 1 Emperor Alexander I, reigned 1801-1825. 2 Emperor Nicholas I, 1825-1855. 3 Alexander II, 1855-1881, assassinated by anarchists. 5 Nicholas II, 1894-1918, martyred by the Bolsheviks at the beginning of the present age of lawlessness. He is now glorified as a Passion Bearer. According to St. Seraphim of Sarov, devil was the first revolutionary, who rebelled against God. That is why all revolutions are adverse to Christianity and have a diabolic origin. An accurate and unbiased analysis of Russian revolutions in the 20th century shows they were no exception of this rule being apparently of diabolic nature. 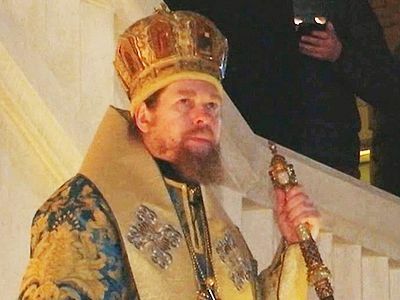 It would be interesting if we could correlate Russki prophecies on the restoration of the Tsar before antichrist, with Hellenic prophecies on the restoration of Byzantium under the sleeping marble king, Ayios Ioannis Vatatzis, (following the destruction of turkey and the west!!! ), again just before the coming of antichrist. Will we have two parallel Orthodox Kingdoms, one Byzantium and one Russkie? Interesting food for thought.